Black satin fabric covered base with nero black crystal detailing...Stunning masquerade mask! Ultra-modern, distinctive and glamorous, this fabulous black Asimmetrica Venetian luxury ball masquerade mask with Jet black satin fabric covered base & beautiful nero black crystal detailing will ensure you turn heads whatever the occasion.....Guaranteed to make you the envy of all your friends - What a mask for the woman who demands attention!!! 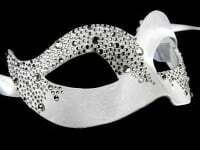 With traditional black satin ties for a comfortable fit this luxury mask is perfect for your next masquerade party, Venetian masked ball or wedding/prom party.